Wednesday is Saint Patrick’s Day (don’t forget to wear green or the leprechauns will pinch you) and even though my family is only moderately Irish, and I, in fact, have never been to Ireland, my family celebrates every year without fail. Part of it is that my grandparents were married on March 17 (and enjoyed the luck of the Irish — they were married for 59 years), and part of it is that we happen to like celebrations, and if that celebration involves food, then we’re definitely in. So March 17 sees us feasting happily on beer, corned beef, more beer, English mustard (don’t tell the people who are actually Irish! ), beer, cabbage, Jameson’s (a change from beer), mashed potatoes, and always, always Irish soda bread. This might not look like the Irish soda bread you’ve seen — there are no raisins, no caraway seeds. But this version, a “brown soda bread” made with half whole wheat and half white flour, is more authentically Irish, according to Darina Allen and Rory O’Connell, founders of the Ballymaloe Cooking School. And it’s incredibly satisfying – hearty and only slightly sweet, with a crunch to the crush and a melting interior. Warm from the oven with a pat of butter, it really can’t be beat. Fortunately, it takes about 2 minutes to put together, and only 30 minutes to bake, so you can mix some up whenever the craving hits. If you want to bake at home, but you’re intimidated by yeast bread and can’t find the perfect biscuit recipe, this is the bread for you. The lightness and characteristic flavor comes from the combination of the acid in the buttermilk with the base in the baking soda, creating volcano of air bubbles that makes this bread into a soft teatime treat, instead of a brick. 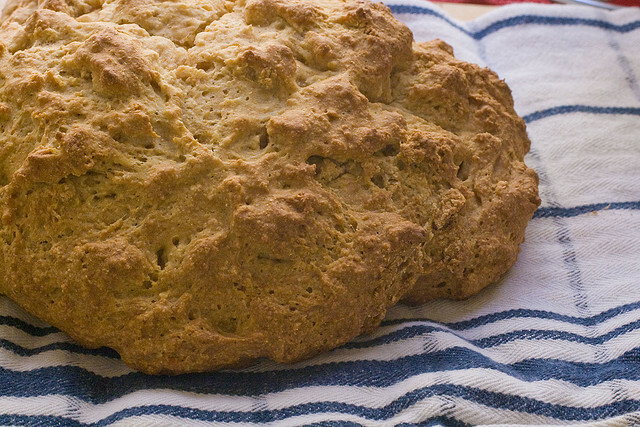 Unfortunately, soda bread doesn’t keep well, so share it with friends and wash it down with plenty of beer (or tea — this is also a great breakfast food.) And Erin Go Bragh. 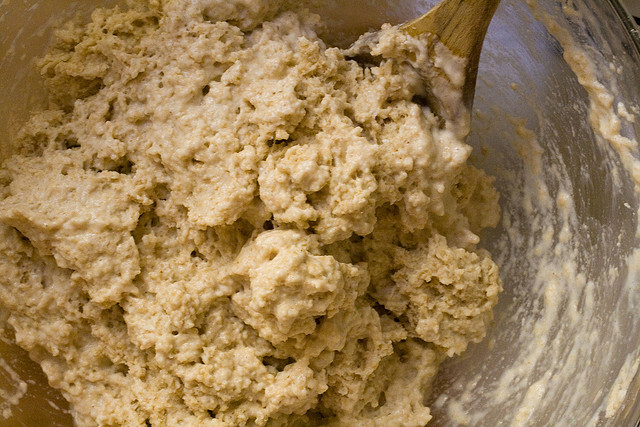 In a bowl, combine the flours, sugar, soda and salt, and stir until mixed well. Add in the buttermilk (you want the dough to be fairly wet -- almost a batter, and it should be shaggy in appearance -- I used 1¼ c. buttermilk in the pictured bread) and stir until all the ingredients are combined. Place the dough on a floured or lined cookie sheet, shape into a rough round loaf,and slash the top in an "X" with a sharp knife. Bake at 400 degrees for 30 minutes, serve warm. Today is the last day to enter the giveaway to receive a copy of Auberge of the Flowering Hearth, the cookbook that inspired Alice Waters! Enter now! I attended some Irish cooking classes this month. 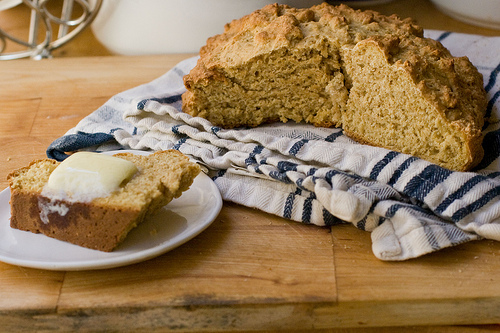 And, was thrilled to find some delicous Irish soda bread. Chef Gaydos, the instructor, had attended the Ballymaloe Cooking School and had wonderful insight into the cultural nuances and history of Irish cookery. We aren’t Irish either, but I’m board with this kind of celebration. I would LOVE to go to that cooking school someday – what a great experience in an interesting country. The buttermilk in this bread is so great for texture and flavor.